One more a tip o’ the hat to Phil Windley for saving me a thousand words. He’s wonderfully articulated the reasons you should support Joe Andrieu’s Kickstarter project for the Standard Information Sharing Label. 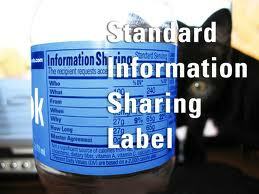 Just like we have a standard label for drugs so that people can more easily understand how to take a drug and what it does, we should have a standard label for sites that want you to share your personal information. It won’t get us everything that the Respect Network will, but it’s a good step in the right direction. Move your cursor right on over to the project and show you care about seeing what’s really happening with your personal data. This entry was posted in Digital rights, Identity Rights Agreements, Personal Data Ecosystem, Privacy, Respect Trust Framework. Bookmark the permalink.